Sixty-One, Dogfish Head's first new core beer since 2007, was born at the crossroads of serendipity, experimentation and brotherhood. The name Sixty-One is a reminder that this beer is Dogfish Head’s best-selling 60 Minute IPA plus one new ingredient: syrah grape must from California. The label, painted by Sam, is a twist on a typical watercolor. Rather than using water, Sam mixed the green pigment with beer and the red pigment with wine. And because Sixty-One pairs so well with chocolate, he painted the browns on the label with melted chocolate. To celebrate the launch of Sixty-One, Dogfish Head and Will Oldham, who performs as Bonnie "Prince" Billy, are releasing a limited-edition record. Bonnie "Prince" Billy has performed many times at Dogfish Head's coastal Delaware brewpub and has become a good friend, the kind of friend you'd give a big ol' man-hug to. He wrote an original song called Sixty-One that was inspired by this beer's origins, and on the flip-side of the record is a rollicking Bonnie "Prince" Billy version of the innuendo-filled Dominoes classic "Sixty-Minute Man." The record will be available only at Dogfish Head's Delaware brewery and brewpub, where you'll get a four-pack of Sixty-One, the record and a big, ol' hug from a Dogfish Head co-worker. Sixty-One, which clocks in at 6.5% ABV, will debut in March. 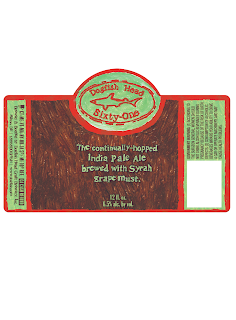 Four-packs will be available four times a year throughout Dogfish Head's 27-state distribution network. Suggested price is $8.99-$9.99.